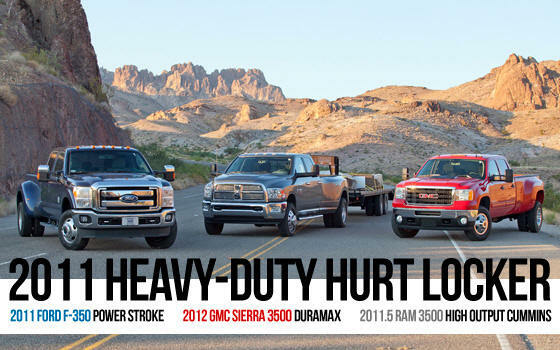 I’ve been privileged to be involved in four of PickupTrucks.com’s truck comparisons. I push to get all the possible tests related to towing of course and Mike Levine goes the extra mile to present accurate data. These pickup truck shootouts become the benchmark for truck comparisons. The largest truck related audiences read these reports. Truck manufactures use the data to improve their trucks with OEM engineers riding with us across the country. It’s a good feeling to be part of an automotive journalist group that can be heard by OEM’s providing our feedback and the feedback of our readers to get trucks designed to meet our needs. As always, there’s enough data in this report for you to pick your winner for the way you use a truck. PickupTruck.com Heavy-Duty Hurt Locker 2011 truck comparison. This test was designed for maximum use. Not often can you review trucks at their max limit. We towed 19K plus trailers in 100 degree plus air temp. at 80mph in Utah (legal). We towed extreme grades on desert and the Rockies. 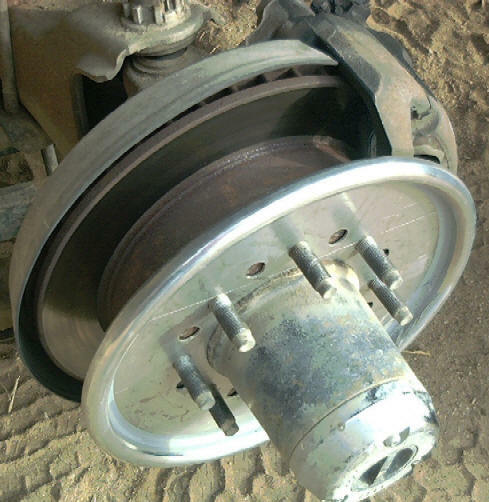 Brake tested with loaded trailers, recorded tons of useful data and had no breakdowns or blowouts. Like in real life, we worked long hours, kept our logbooks updated and pushed the trucks to the limit. I had a DOT # but had to upgrade to CDL to drive in this test with new one ton trucks having a GVWR of 30,000 lbs. I’ll report later on the Commercial Drivers License tests and I’ll have a complete report on the Titan Trailers Ruff Neck 30′ flatbeds. Of all of the trucks we’ve tested in the past decade, the latest heavy-duty pickups seem to have stoked competitive fires and brand rivalries like no others. 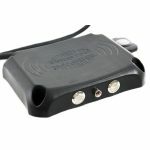 Not just among enthusiasts, but also among the manufacturers. 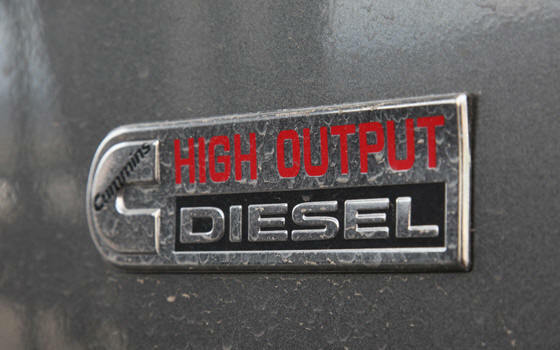 Every few months, there have been upgraded power levels and capabilities as truck makers have tried to one-up each other. 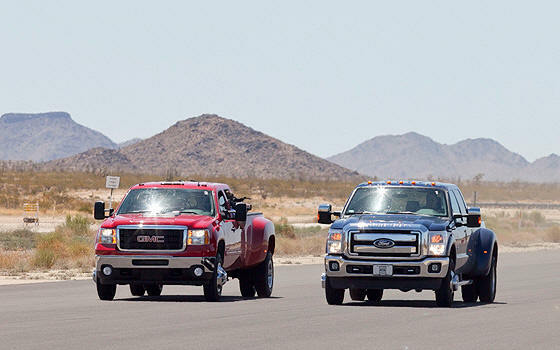 We created the ultimate comparison test as a complement to last year’s comprehensive Heavy-Duty Shootout and Rumble in the Rockies tests to find out — once and for all — which current heavy-duty pickup is best overall. It’s a comparison so tough that we call it the Heavy-Duty Hurt Locker. The Heavy-Duty Hurt Locker is based on lessons learned from previous tests and feedback from readers. 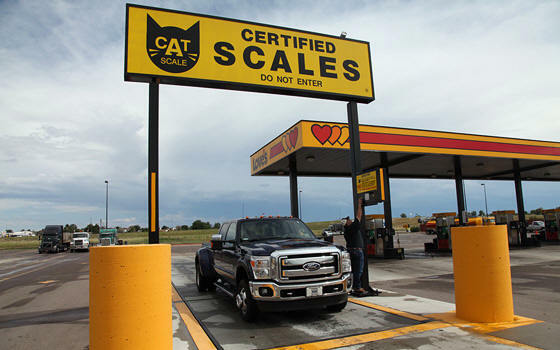 It’s a 2,200-mile, four-state slog towing trailers that weigh almost 10 tons each and push each truck’s gross combined weight to more than 90 percent of their gross combined weight rating – levels so high that it forced those of us without one to get commercial driver licenses. The comparison started in Brighton, Colo. It ended there seven days and 2,200 miles later. 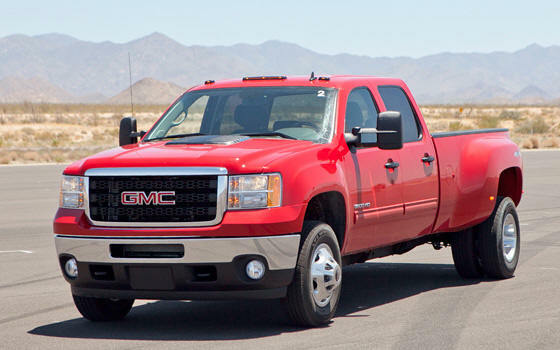 *As of Aug-15, 2011, 2012 GMC Sierra 3500HD pricing has not been announced. Test price is estimated. The Hurt Locker includes driving up two of the nastiest mountain climbs in the U.S. – from hot summer temperatures of more than 100 degrees in the Arizona desert to the oxygen-starved peaks of the Colorado Rockies, 11,000 feet above sea level. Through it all, we measured fuel economy, acceleration, power and braking and evaluated the confidence that each truck gave its driver. 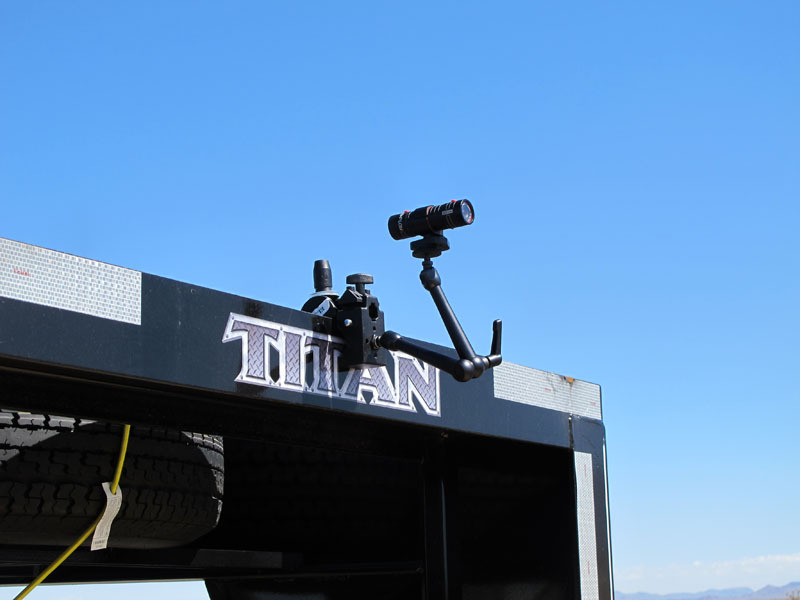 We teamed up with our friends at Diesel Power Magazine and MrTruck.com, and we partnered with Titan Trailers, which supplied the gooseneck trailers, and Pioneer Sand, which provided about 36,000 pounds of ballast. To push the trucks and their diesel engines to the limit, we decided to test one-ton dual-rear-wheel models from Chrysler, Ford and GM. These rigs can tow and haul more than any other pickup on the road. Remember the one-upmanship battles among the manufacturers that we mentioned earlier? 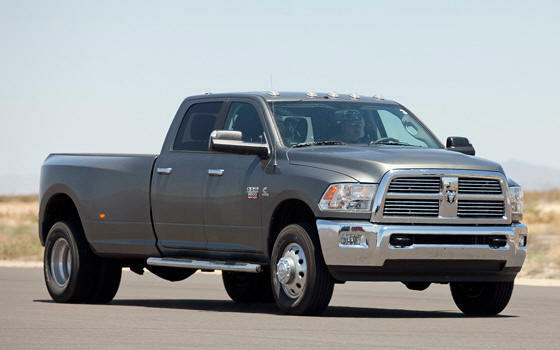 This 2011.5 Ram 3500 is the latest example of how quickly the game is changing in the heavy-duty pickup segment. Ram is listed first because it has had the most work done to it. In response to major power increases from Ford and GM, Ram collaborated with its longtime diesel engine partner at Cummins to boost torque in the inline-six-cylinder from 650 pounds-feet (in early 2011 Ram HD pickups) to 800 pounds-feet for all 2500 and 3500 models equipped with Chrysler’s 68RFE six-speed automatic transmission. That ties Ford’s best-in-class torque rating for the all-new 6.7-liter Power Stroke V-8 Diesel. To manage that torque increase, upgrades include a new engine control module with new calibrations that allow the engine to achieve peak power at a more desirable rpm range. The Ram’s six-speed gearbox also gets a new torque converter with updated shift calibrations to handle the increased power and a re-engineered crankshaft damper that reduces engine noise and vibration, for improved drivability. 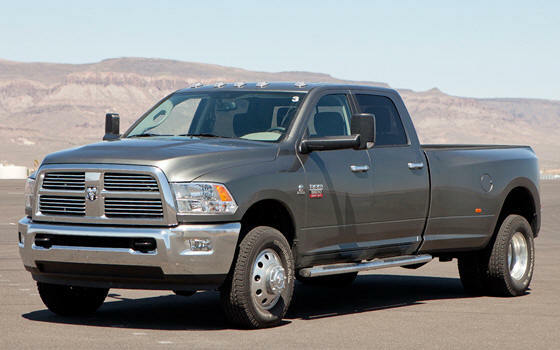 Rams HDs with manual transmissions stick with the standard 350 hp, 650 pounds-feet 6.7-liter Cummins diesel. For Ram dual-rear-wheel models, there’s a new Max Tow option package that features a towing-optimized 4.10 rear axle that includes stronger helical gears and upgraded bearings, along with a finned aluminum differential cover to dissipate heat. There’s also a new water-to-oil transmission cooler and new power-steering cooler to help manage the higher trailer towing ratings. 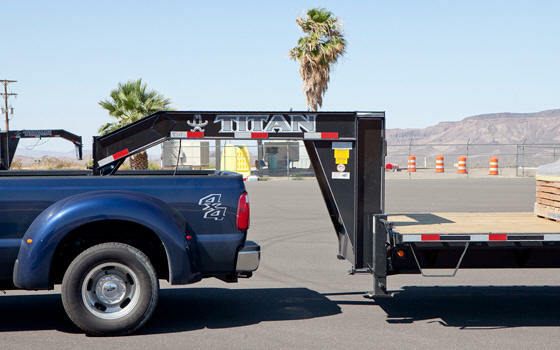 The Max Tow package increases fifth-wheel towing to a best-in-class 22,750 pounds, up from the previous 18,500 pounds. 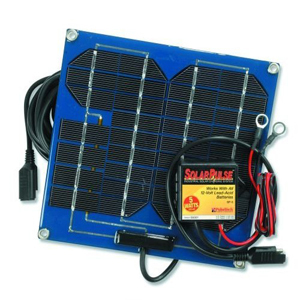 The GCWR rises to 30,000 pounds in certain models. 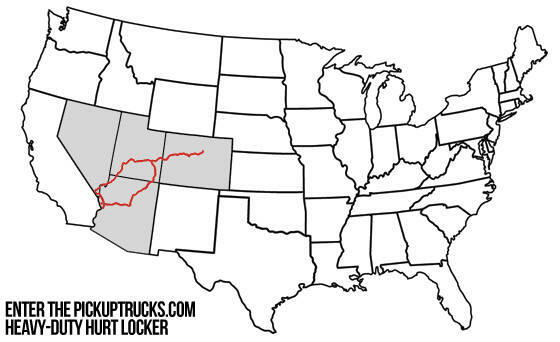 The 2011 Ram 3500 wasn’t included in the Rumble in the Rockies because, at the gross combined weights we tested at, we exceeded its 24,500 GCWR by more than 2,500 pounds. Now, in the 2011.5 Ram 3500 we tested, the 4.10 rear axle and Max Tow package added an amazing 8,000 pounds of trailer towing capacity over the standard 3.73 setup. That gave it a GCWR of 29,000 pounds, and a spot in our grudge match. 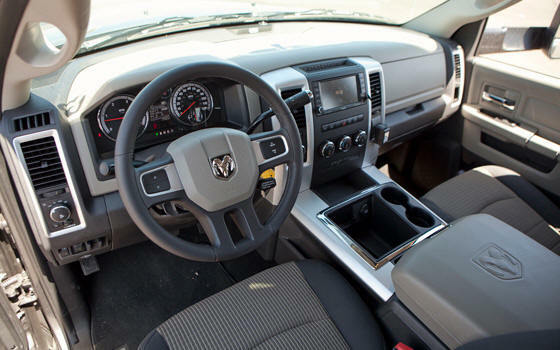 Our Ram test truck was configured as a middle-of-the-road SLT model with the optional Big Horn regional package that adds convenience features and chrome and leather highlights. It also came with a 6.5-inch touch-screen multimedia head unit with Chrysler’s new entry-level Garmin navigation system, Uconnect voice command with Bluetooth and a ParkView backup camera. Also included was a factory spray-in bedliner, perfect for resisting gradual wear damage from the trailer’s breakaway chains. In classy Mineral Gray Metallic with sharp-looking 17-inch aluminum wheels and stout styling, the Ram 3500 was the best-looking one-ton we tested, but it was also the most expensive at $58,200. Although it’s a model year newer than the GM Heavy-Duty pickups we tested in the HD Shootout and Rumble in the Rockies, the GMC Sierra 3500 got only marginal changes, including improved messaging about diesel exhaust fluid levels. The Sierra 3500’s 6.6-liter Duramax V-8 is rated at 397 horsepower and 765 pounds-feet of torque. For 2011, the Sierra and Chevy Silverado HD pickups got all-new front and rear suspensions, brakes, axles and fully boxed ladder frames. The eight-cylinder Duramax is the fourth generation of GM’s HD diesel. Sixty percent of its hardware is new, and it’s 97 hp and 245 pounds-feet stronger than the original 2001 Duramax. GM says the new diesel engine is 11 percent more fuel efficient than the previous Duramax. We’re big fans of the Duramax’s performance, as it has proven itself time and again over the past year, but our Fire Red Sierra continues to show its age inside. 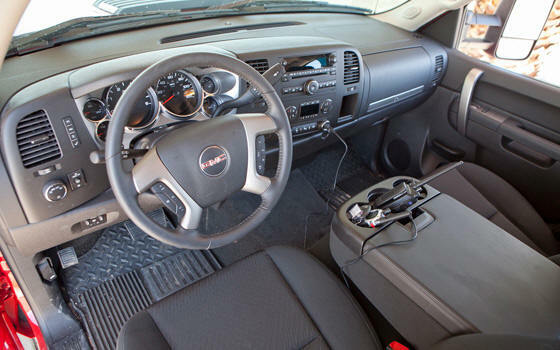 Like the Ram and Ford, our GMC in the midrange SLE trim had cloth seats, but the controls and colors made it feel stripped down. Black was the dominant color except for Spartan silver brightwork around the gauges, steering wheel and glove box. The rear of the Sierra felt cramped, especially with five adult males packed in during testing in Colorado. The Sierra lacked running boards, making entry into the cabin more difficult compared with the other two trucks and exposing the large DEF tank hanging off the passenger side under the front door. Pricing for 2012 GMC HD pickups hasn’t been announced yet, but based on 2011 pricing, we estimate the Sierra we tested would carry an MSRP of $55,710, the lowest of the three. 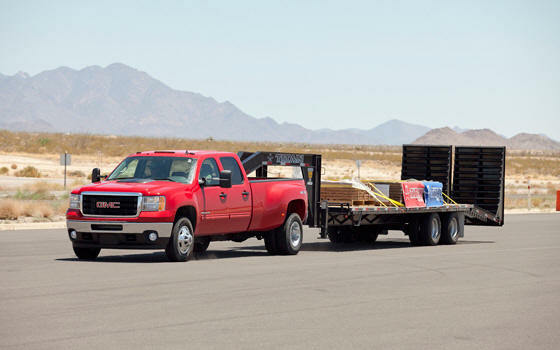 On Aug. 15, General Motors announced that the 2012 GMC Sierra 3500 and 2012 Chevy Silverado 3500 claim best-in-class towing and hauling among one-ton pickups, continuing the one-upmanship trend that led to this test. 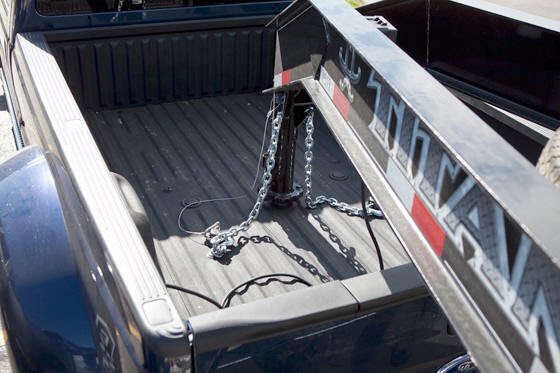 New rear springs, shackles, cargo box mounts and strengthened cargo boxes will enable the Sierra and Silverado HDs to tow up to 23,000 pounds with a fifth-wheel trailer, up from 21,700 pounds in 2011. Sierra and Silverado will also lead the class in dually payload, with a 7,215-lb. rating for the 3500HD regular cab 6.0-liter V-8 gasser dually. 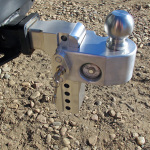 Finally, upgraded trailer hitch receivers increase conventional towing to 18,000 pounds, up from 17,000 pounds last year. All changes will be on 2012 models arriving in dealerships in the fourth quarter of 2011. These changes don’t have any impact on the HD Hurt Locker test or its results. It’s not hard to argue that Ford’s F-Series Super Duty trucks are the benchmarks in the segment whenhalf of the heavy-duty pickups sold in the U.S. have Blue Ovals in their grilles. 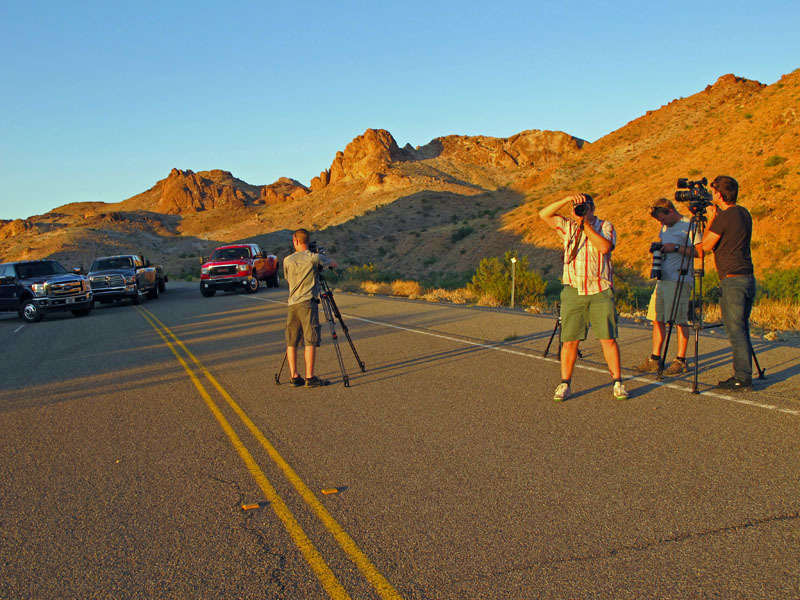 During our HD Shootout last year, we didn’t have the Job 2 tune for the 6.7-liter V-8 Power Stroke Diesel. The free powertrain firmware update became available just a few months after the trucks were introduced, and it boosted power and torque ratings from 390 hp and 735 pounds-feet of torque to an astonishing 400 hp and 800 pounds-feet. This time, like the Rumble in the Rockies, our Super Duty test truck came with the latest engine and transmission calibrations. The Dark Blue Pearl Metallic F-350 came in the XLT trim, the volume trim of the F-Series lineup. 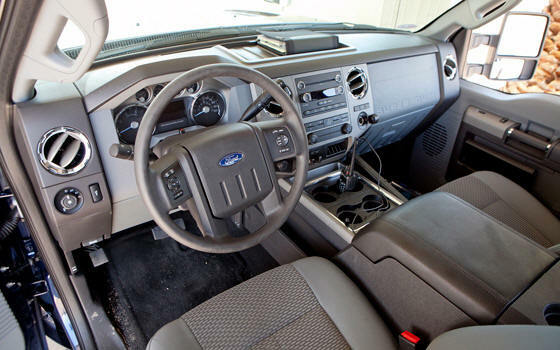 Its interior featured the same high-quality layout we’ve come to appreciate in Ford’s pickups. The instrument panel came with a high-resolution 4.6-inch productivity screen that provides easy access and rich graphics to provide critical truck data such as fuel economy, driveline and off-road and trailer information. Our biggest gripe with the Super Duty’s interior is that the center stack is packed with buttons that can take drivers’ eyes – and attention – away from the road. 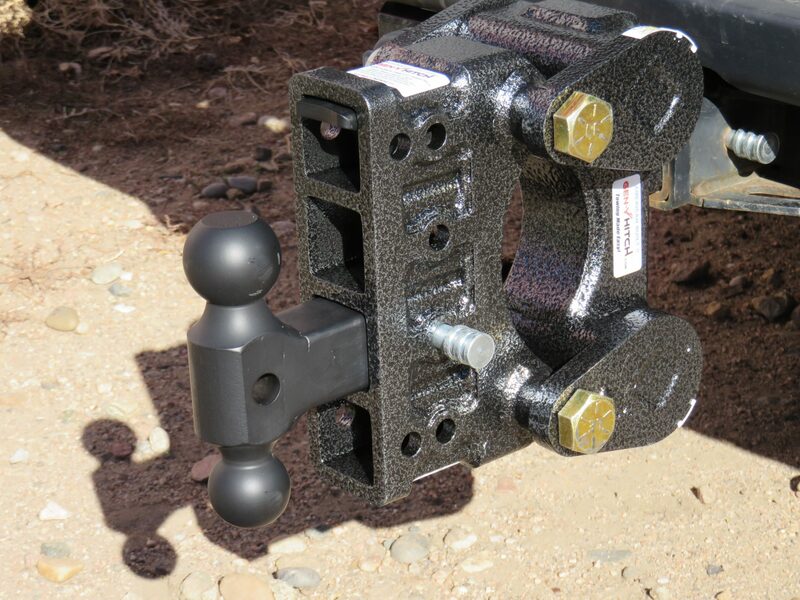 Although each truck we tested had gooseneck hitches, the F-350 was the only truck to offer a factory-installed gooseneck hitch prep package, including bed floor cuts, frame mount and wiring. 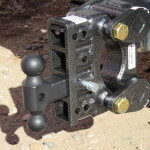 The hitch ball that sits in the bed is sold separately. 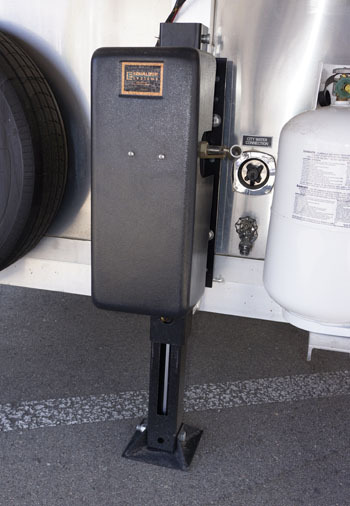 For the Ram 3500, it takes about an hour to install a Mopar gooseneck trailer hitch that attaches directly to the frame rails under the bed. 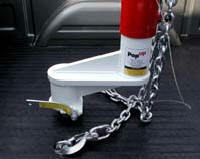 The GMC Sierra 3500 requires aftermarket installation of a similar package. 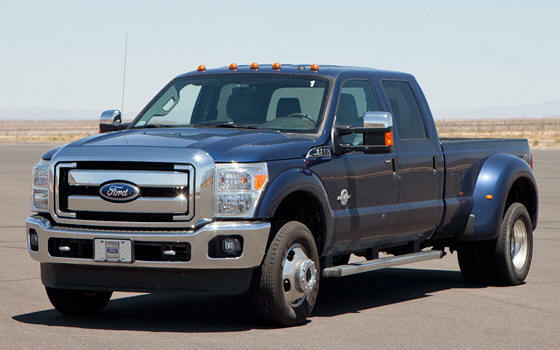 The F-350 was priced in between the other two trucks, with an MSRP of $56,900. 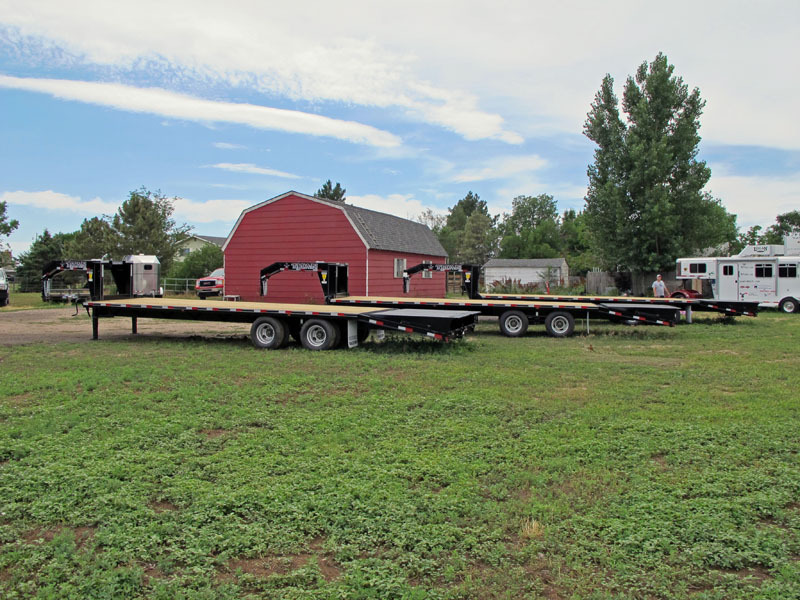 Titan Trailer provided us with three brand-new, 30-foot flatbed trailers (24-foot floor and 6-foot dovetail ramps) with gooseneck hitches. 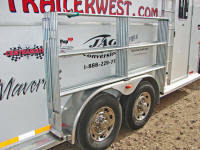 Each empty trailer had a curb weight of about 7,100 pounds. 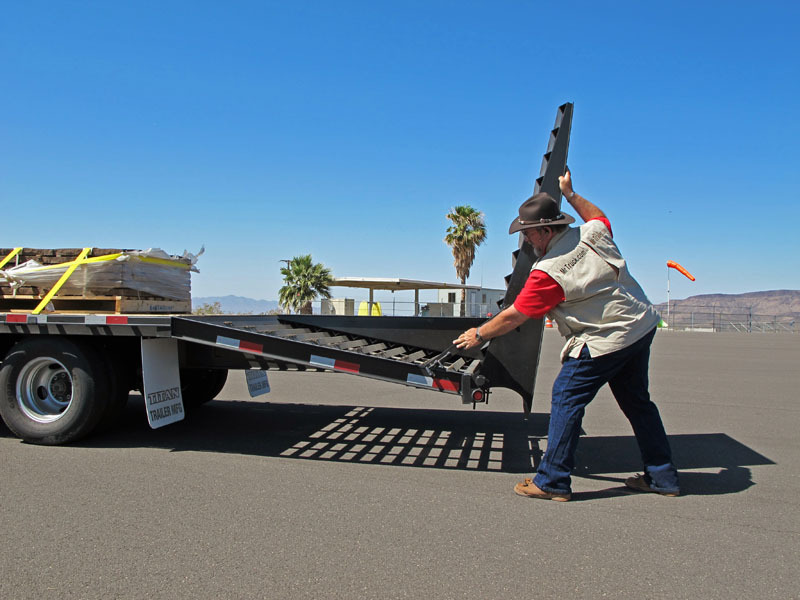 The Ruff Neck flatbeds feature tandem dual-rear-wheel 10,000-pound rear axles to support some of the heaviest loads you can tow with a pickup. They also have electric brakes on all four wheels and LED brake lights. 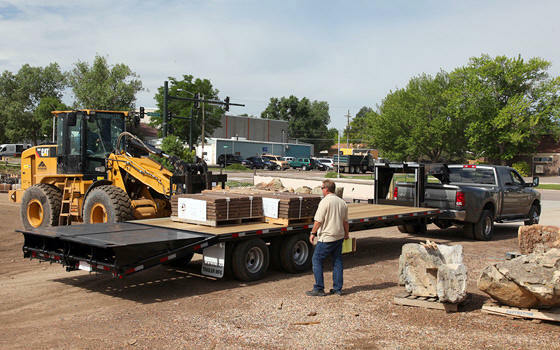 We traveled to Pioneer Sand in Northglenn, Colo. (just outside Denver), where we placed six pallets of earthstone slabs on each trailer. 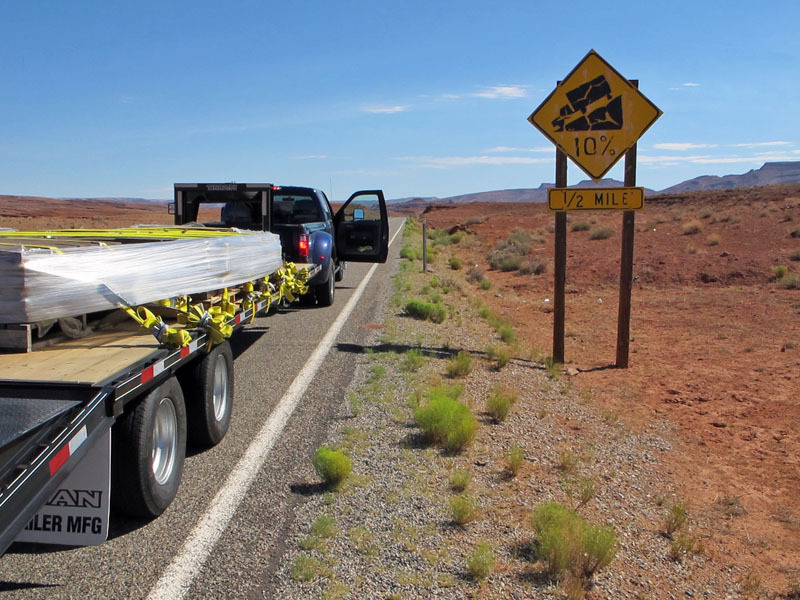 That’s about 12,300 pounds to bring the ballasted weight of each trailer to 19,400 pounds. That brought the GCWR for the GMC to 27,600 pounds before five adult males jumped in and added another 1,000 pounds, for a grand total of 28,600 pounds, or 98 percent of the Sierra’s GCWR during our hill climb tests. The total for the Ford F-350 was 28,160 pounds, or 94 percent of the Super Duty’s GCWR. We traveled to Chrysler’s Arizona Proving Grounds (formerly owned by Ford) in Yucca, Ariz., about halfway between Kingman and Lake Havasu City. There, we set up camp on a multiple-acre stretch of flat tarmac. 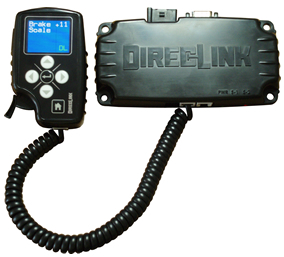 It’s perfect for determining time and speed performance over a fixed distance, unloaded and loaded. What’s the point of running heavy-duty pickups through the quarter-mile? 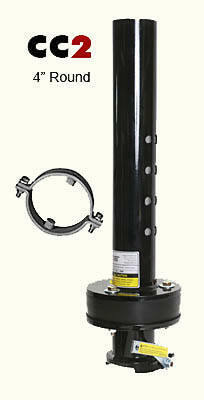 Isn’t the job of a one-ton rig simply to deliver a heavy load or haul a trailer from Point A to Point B? You’d be correct, except for the one circumstance where the quarter-mile test almost always comes in as a handy measurement: merging into highway traffic. Weather conditions recorded at Chrysler’s Arizona Proving Grounds on July 13, 2011. The blue lines indicates each truck’s testing start time.